My favorite of the many excellent stories in RJ Smith's The One describes a gun hustle devised by James Brown's father Joe Brown, to whom Smith devotes more detailed and unfavorable attention than any other Brown biographer to date. Joe Brown and a confederate would approach any man visibly packing and challenge him to shoot them. When he didn't, they would take his gun. Simple once you think of it, right? This story told me something I hadn't fully grasped about the roots of Brown's arrogance, which was as unmatched as his sense of rhythm in a calling that has made self-regard its currency since long before Little Richard or Al Jolson--since Charles Dibdin, say, or one of the Himalayan shamans Smith links plausibly to Brown. The One tells us more than we may want to know about Brown's people skills. It establishes that Joe Brown brutalized his son, who loved him all his life, as well as James's mother, who Smith believes was less absent than the singer always claimed. It documents James Brown's lifelong gun use, sometimes on the women he brutalized in turn--the Tammi Terrell sequence, which involves a hammer, is especially hard to take. It makes clear that he always supplemented his income from the multiple jobs he was working as of age eight by stealing whatever he could, and argues convincingly that his three years in youth detention taught him what he needed to know about the discipline he imposed on his bands for 50 years. It reports that his faithful guitarist Jimmy Nolen ordered his wife to convey to Brown his dying wish: that Brown treat his replacement better than he treated Jimmy Nolen. Yet The One is no debunk, as even those who worship this incomparably crucial musician should understand. That's because--unlike Michael Jackson, say--Brown isn't loved as a saint but admired as a titan. All Smith does is put flesh on the control freak we already knew was there. And that isn't by any means the best, freshest, or most diligently researched thing about The One, because Smith excels in both his portrayal of Brown's specifically "Georgialina" and then also "Affrilachia" southernness and, even more important, his comprehension of Brown's art. He uncovers two crucial early Brown drummers: French Quarter-born Charles Connor and Clayton Fillyau, a Tampa-based Creole who got a life-changing lesson in the rhythmic concept of The One from Huey "Piano" Smith drummer Charles "Hungry" Williams. This prepares the way for a superb breakdown of the decisive tandem of the late '60s, when Brown was inventing funk and modern music: Mobile's Jabo Starks, steeped in both New Orleans second line and the stuttering float of Holiness soul-clapping, and Memphis's Clyde Stubblefield, whose straight eight provided a "strong, broad back for New Orleans drummers to climb on." But he's equally good on cheerful, acid-tripping troublemaker Bootsy Collins, who transferred the funk first from the drums to the bass and then from James Brown to George Clinton. 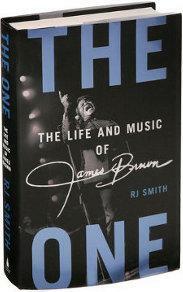 Although Brown got religion as his public power diminished, Smith makes the crucial point that when it came to gospel Brown "was of the music, but not quite of the faith." This is another way of saying he was his own God, his cape ritual an enacted rebirth that does indeed track back to shamanism even though Brown thought it up himself. He makes the link between Brown's nonstop touring and his prowess as a dancer who incorporated local moves from all over America into a single ever-evolving routine. He demonstrates that for all Brown's talk of black capitalism he was a terrible businessman--"analytic" to his bones, he couldn't delegate because he couldn't trust. But though he treated most of his musicians even worse than he treated Jimmy Nolen, his bandleading was beyond genius. "If you were with Brown for any length of time," Smith writes, "you understood what you would get out of it, and what would never be yours. If you wanted to be a star, this was not the place to be. If you wanted to get rich, or record your own music, or see your name on an album, that was not likely to happen. But if you wanted to see the world and play some amazing music for crowds huge and small, you could not do much better." In fact, you could not do any better. Amen, Jimmy. Amen, Jabo. Amen, Clyde. Amen, Bootsy. Amen, Mr. Brown.